"Virtual reality is showing significant promise for promoting faster and more complete rehabilitation, but the cost of many systems is still prohibitive for widespread deployment in outpatient clinics or patients' homes." In one exercise, a patient attempts to wipe clean four vertical bars that obscure an image on a computer display. The bars are erased in proportion to each finger's flexing. 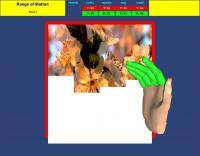 The Rutgers hand rehabilitation system is an example of virtual rehabilitation, which combines virtual reality � computer-generated interactive visual environments in which users control actions in a lifelike way � with traditional therapy techniques. Virtual rehabilitation gives therapists new tools to do their jobs more effectively and engages patients who may otherwise lack interest or motivation to complete normal exercise regimens. The Rutgers engineers are describing their work at the fifth International Workshop on Virtual Rehabilitation taking place Aug. 29 and Aug. 30 in New York City. "Virtual reality is showing significant promise for promoting faster and more complete rehabilitation, but the cost of many systems is still prohibitive for widespread deployment in outpatient clinics or patients' homes," said Grigore Burdea, professor of electrical and computer engineering and a noted inventor of virtual rehabilitation technology. "While it's essential to keep pursuing breakthrough technologies that will initially be costly, it's just as important that we find ways to make innovative treatments accessible to the many patients who need them." Ciprian Docan, a graduate student in electrical and computer engineering at Rutgers University, demonstrates a modified home video game system to assist stroke patients with hand exercises. In one exercise, a patient attempts to wipe clean four vertical bars of "dirty" pixels that obscure a pleasant image on a computer display. The bars are erased in proportion to each finger's flexing motion, giving the patient immediate feedback on his or her performance. And in an exercise to promote finger flexing speed, a patient tries to make a fist quickly enough to "scare away" a butterfly flitting around on the screen. The engineers noted that the gaming glove they use doesn't have the accuracy and resolution of gloves designed specifically for rehabilitation, nor can it measure exact joint movement or provide force feedback. But such systems may be attractive for clinics that can't afford more expensive equipment and could open the door for supplemental home training with remote monitoring by a clinician over an Internet connection. The system is described in a workshop paper authored by Kira Morrow, Ciprian Docan and Burdea of Rutgers, and Alma Merians of the University of Medicine and Dentistry of New Jersey. The International Workshop on Virtual Rehabilitation, chaired this year by Burdea, brings together research and clinical experts from 11 countries to discuss how virtual reality can help people recover from strokes, injuries and other physical disorders, as well as psychological trauma. It also features exhibits by eight vendors of commercial rehabilitation equipment and systems using robotics and virtual reality.